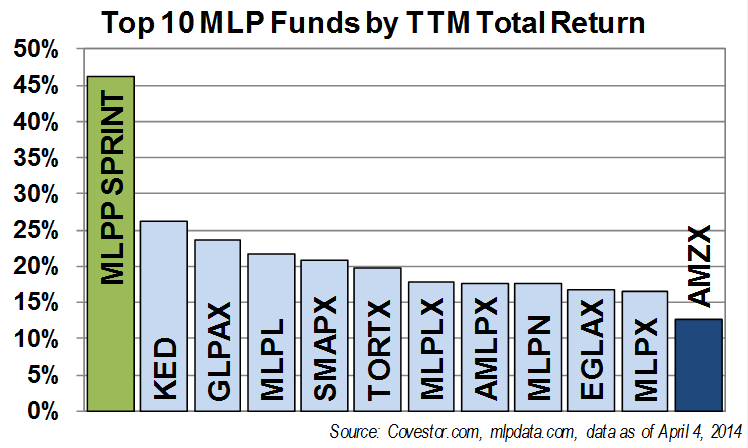 The following chart shows the top 10 MLP focused funds, ETFs, ETNs, etc. ranked by their trailing twelve month (“TTM”) total returns as of April 4, 2014. I also included the MLP Protocol Sprint Portfolio and the Alerian MLP Total Return Index for comparison purposes. Top 10 TTM Total Return data as per MLP Data. MLP Protocol Sprint Portfolio total return as per Covestor. This entry was posted in Other and tagged AMLPX, AMZX, distributions, dividends, EGLAX, GLPAX, KED, Master Limited Partnerships, MLP, MLPL, MLPLX, MLPN, MLPs, MLPX, SMAPX, Sprint Portfolio, TORTX, yield. Bookmark the permalink.